The compressed air breathing apparatus BD mini, which now features a redesigned, maintenance-friendly pressure reducer, is especially suited for short duration work in confined spaces. Its compact size and versatile design permit the use of various carrying modes. Thus the apparatus is ideal for sites that can only be reached through narrow entry openings or for work in confined spaces. Of course, the BD mini can also be carried on the back like a "large" compressed air breathing apparatus and can also be used for brief explorations or inspection tours. 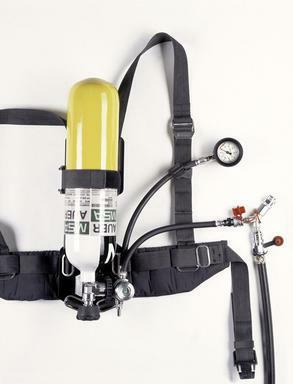 With a coupling for compressed airline breathing apparatus [available as accessory], the BD mini can be connected to a stationary air source. This permits the operator to remain at the worksite for longer durations. The BD mini supplies air for the approach, as well as for the return.